This is the second in a series. The last post, No More News? introduced the idea that consuming news can harm your mental health, and explored a few reasons why people might want to continue taking in news. So, once you know yourself, the next step is . . .
Once upon a time, there were reporters who sought out important information to share with their readers. To pay for the expense of printing the stories, they allowed companies to put their information in the papers in the form of advertisements. But there was a clear boundary between editorial content and ads. And the Editor was in charge of deciding what was in the paper. Now, it’s all more complicated. Now we have something called the 24 hour news cycle, which means that actual events happening in the world have to be edited to fit the programming needs of the advertisers. There are websites which appear to be legitimate sources of news which have no integrity and behave more like the old grocery store tabloids. Even those that are trying to tell the truth are up against such powerful competition that they have to sensationalize their stories. Most times, the point of the exercise is to attract more viewers and earn more money. Occasionally there is a better reason, but even this is dangerous. Sensationalized stories are understandable when you are trying to get jaded people to care about something. But what happens when a news piece that has been pumped up to maximum meets a person with very high levels of sensitivity? It’s like a bomb going off in a soul. For instance, there are many climate change deniers. Suppose that a story was designed to break through their barriers, blasting them into an awareness of how serious this situation is. And what if it hits a person who can already barely breathe because she is so afraid of what is going to happen in the future? She cannot be blamed for being emotionally crushed by that story. What she needs instead, is a big dose of the positive news in the world of green science. Not every source of news is appropriate for every person. So, if you know why you are consuming the news (or, as my prof used to say “the bad news“), and you know that the media exists primarily to earn money and sell products and services, what can you do about it? First of all, watch your dosage. It’s not necessary to wear a blindfold and earplugs. You can still keep track of current events. But maybe you want to limit your news intake to a less powerful source- a printed newspaper, a radio report, or a news magazine that only comes out weekly. Secondly, you can break the news habit and make yourself a more balanced person by varying your sources. Sometimes I try to get a more worldwide perspective from the BBC or a more local one from a small community paper. 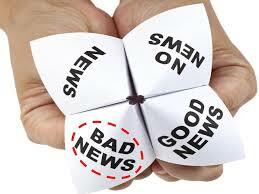 If I’ve heard a lot of gloom, I’ll deliberately search for good news. It’s out there. And if I want to feel like I’m becoming a better person, I’ll read things written by people I wouldn’t normally agree with, to understand why they have a different point of view. Finally, make sure that what you are reading is true. All news reports may be biased in some way, but avoid the sites that are actually lying, and not even trying to have integrity. Some are trying to be funny (theonion, thesyruptrap, thisisthat) but many are trying to manipulate people’s emotions to make money. If in doubt, there are fact-checking sites like snopes or the Straight Dope. There is much more to be said about this. Maybe I’ll write a follow-up. But I’d love to have your input for that. What makes it possible for you to maintain your equilibrium despite the news? Or do you avoid it entirely?